PR & Social Media Back Talk: Which One is the Billionaire and Which is the Comedy Star? Could they be the same person? Which One is the Billionaire and Which is the Comedy Star? Could they be the same person? 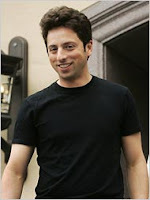 Check out these photos of Google's Sergey Brin and Scrub's Zach Braff. Can you pick out which one is the billionaire and which is the comedy star? Or could Brin and Braff have more in common than first names that begin with a sibilant sound? The answer is yes -- their last names are remarkably similar, making it easier to for the billionaire comedy star to remember which name he's using at the time. After all, have you heard of them ever being in the same place at the same time? I can't be the only one who noticed.